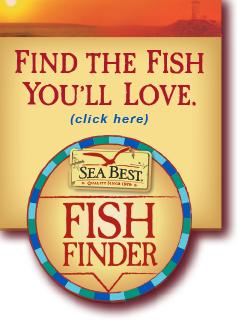 The Sea Best brand represents a complete line of quality frozen seafood that appeals to all levels of seafood lover. No matter what your level of cooking experience, we offer a variety of quality items to help make it easy to take seafood to the table. Choose from over 16 varieties of quality frozen, and vacuum packed fish fillets, from favorites like cod and tilapia to the exciting flavors of Ahi tuna and Mahi Mahi. Sea Best offers shrimp varieties for all tastes. Choose from cooked, raw, shell-on, peel & deveined, and more. Each of our shrimp varieties are packaged in a resealable bag for easy use with any meal. Our Sea Best Signature line offers sophisticated seafood creations packaged in microwave-safe, oven-safe containers allowing you to enjoy culinary masterpieces the easy way. Our breaded seafood products are perfect for quick and easy family meals or for smaller appetizer dishes to entertain with. Simply prepare and watch your family or guests eat them up. Our wide variety of lobster, crab, scallops and other speciality seafood items, can make any meal a special one. Our Asian inspired Shrimp Soup Bowls deliver authentic flavor in a quick and easy meal solution. Seasoned broth-based soups feature shrimp filled wontons and two Asian flavors.